(SKNIS): A Boys Mentorship Programme is a new initiative of the Department of Gender Affairs, which was launched on Thursday, July 21, at a ceremony held at the Customs and Excise Conference Room. The Programme is starting with 10 boys between the ages of 12 and 17, who attend the Charles E. Mills Secondary School (CEMSS) in Sandy Point. Dion Browne, Gender Field Officer in the Department of Gender Affairs, gave an overview of the programme. The Gender Field Officer said that the aim also includes building self-esteem, resilience, confidence and self-reliance, while at the same time finding new ways for the boys to express themselves and have fun. The Honourable Wendy Phipps, Minister of Gender Affairs, gave the boys some words of encouragement. She pointed out a few issues that would be extremely important to address in order to make the programme work. The Minister outlined other issues such as grace, teachability, love and openness to change. Minister Phipps said a number of desired outcomes are expected from the programme. She further noted that a programme of such nature should facilitate the boys into growing into the God-given potential that is present within them and added that bolstering the family structure would be a crucial element in ensuring this. Several sponsors have committed to assist with the mentoring of the boys. 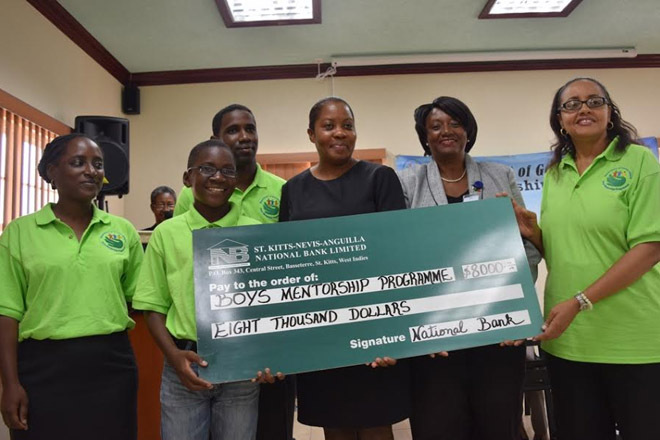 These include Gold Sponsor Rams Trading Limited and Silver Sponsor the St. Kitts and Nevis-Anguilla National Bank. Other sponsors include Nagicor Insurances, Island Auto Supplies, Hobson Enterprises, Delisle Walwyn, Sky Safari and Kantours.